I sat at the bar that surrounds the massive roasting machine at Portola Coffee in Costa Mesa, CA, during a “cupping” event, sipping two different samples of new coffee from—surprisingly—Myanmar, searching my palette for notes of plum or berry lemonade or tapioca (so said the packaging), willing my tongue to weigh the liquid’s body, suppressing my mental revulsion to a side conversation about “mouthfeel,” and enjoying the buzzy camaraderie among coffee geeks. You won’t hear such conversations in Starbucks, and if your advance directive includes getting buried while clutching your Nespresso machine, you may not want to read much further. We are snobs, not unlike the wine and whiskey and tequila-obsessed. (Sometimes we’re that, too.) Our enthusiasm for great coffee isn’t merely the progression of a daily, habitual routine. This isn’t taking out the trash or walking the dog. Nor is it borne simply of a quest for the physical stimulation and focus caffeine bestows, although neither are unwelcome. It is about taste, about searching for perfection, about flavor and body. It is about recipes, about farming, about geography, about cooking, about chemistry. It is about understanding the origins and life cycle of a seed inside of a cherry and how that horticultural and eventual chemical journey can dazzle a palette as much as awaken the brain. I’ve studied coffee. My kitchen is littered with coffee contraptions. I dream of vacations that include visits to coffee farms. I’ve begun to seek out coffee tastings and workshops. My friends mock me. . . until they want a cup. But I am a novice among coffee enthusiasts. I heard one event attendee compare the Myanmar Yay Wow and Lay Ywar coffees to a Rwandan (or was it Kenyan?) vintage. We talked about leaf rust, air flow during roasting, and we shared notes on grind size and consistency. The coffee industry calls this fanaticism “the third wave.” We understand the role of growing elevation, coffee processing methods, and the art and science of roasting. 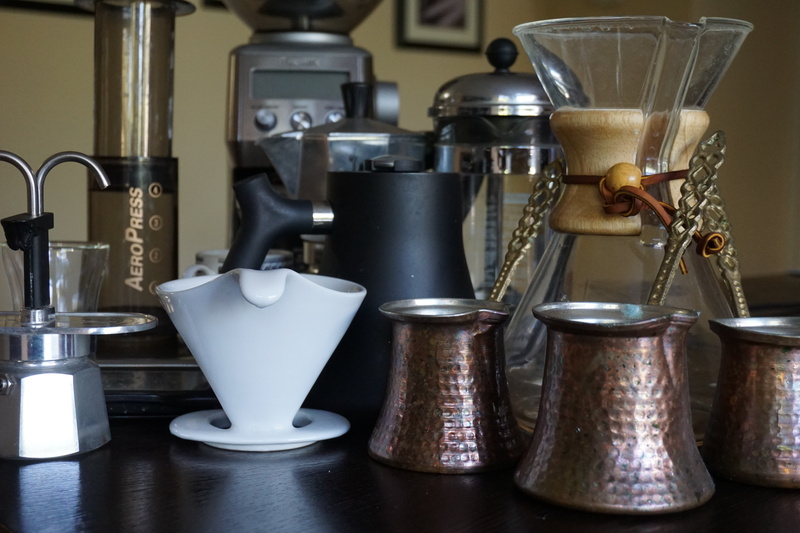 We discuss water-to-ground ratio, water temperature, ideal strength and extraction percentage, and we argue about Kalita Wave pour overs versus the V60, the Beehouse, the Clever. And I’m just scratching the surface here. At one point in the evening, Adam Rizzo, Portola’s head roaster (tasting notes: thin, complex, with a preponderance of lengthy gnome-like beard and mustache, delicate notes of whimsy tempered by exuberance and a bright, slightly floral aura that opens up over time) discussed the difference in taste imparted by using a paper filter instead of a metal one while brewing with a Chemex. Not only must you wash away the paper taste with a quick rinse, but he believes the paper has a tendency to trap some of the residual oils that can give the coffee even more of its flavor. He confided that he may never use anything but a metal filter again. In case you’re wondering, the same philosophy can apply to an Aeropress. We were able to taste for ourselves, and despite my under-developed (for now) taste buds, I understood the difference. I’ll discuss the Myanmar coffee briefly in a subsequent piece. I’ll also begin to talk about some of the science behind coffee’s life cycle, but I’m going to try to do it in a more accessible way, flavored by my own beginner-level mindset. Many of the details exist online, whether in YouTube videos or with instructions and guides provided by some of the leading coffee roasters. Although I’ll try to pull some of that together, I will also combine it with my own experiences—tastings, workshops, discussions with true experts and practitioners, some of which I’ve begun. I have no intention of becoming a barista or roaster, and certainly not a zymologist or chemist (food or otherwise). There are even certifications, some of which are costly and difficult to achieve. I may explore some of that in the pursuit of knowledge, because if I have learned anything over the past several years overseeing the biggest PC enthusiast publications on the planet (Tom’s Hardware and AnandTech), it’s that the extremes of enthusiasm are difficult even for those of us steeped inside to understand, if you’ll pardon the allusion. In the land of enthusiasts (PCs, cameras, fitness, coffee), the journey sometimes becomes the thing. But make no mistake, the “thing” here is an excellent cup of coffee.